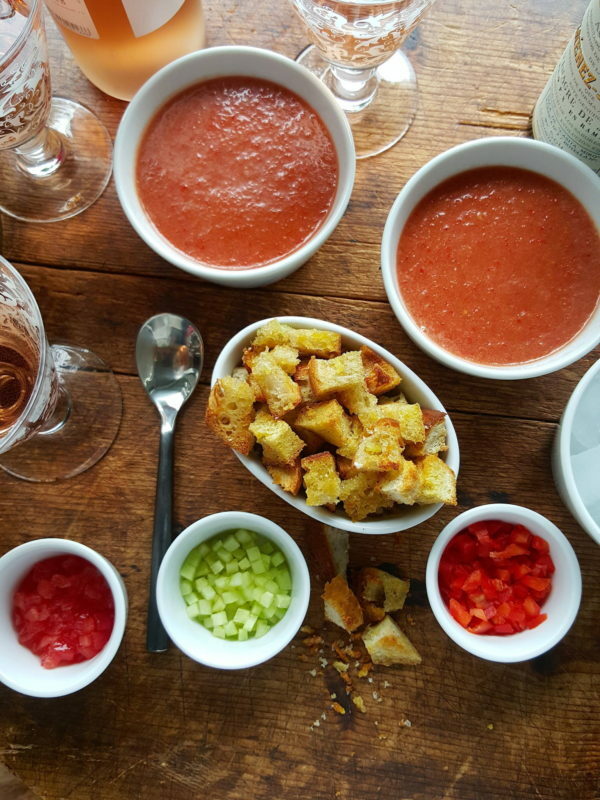 Gazpacho – A chill thrill! 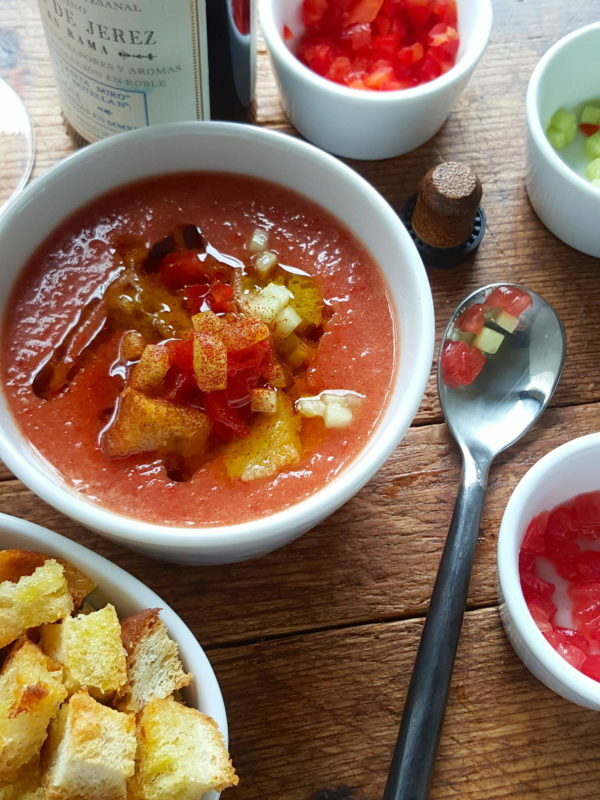 This is one of the simplest gazpachos I have made but it has a fabulously strong flavour of peppers and tomatoes and the garlic croûtons make a great contrast to its smooth texture. It’s a winner- you just can’t fail with this. 1 Drop tomatoes into a saucepan of boiling water, count to 15 and transfer immediately to a bowl of cold water. Peel, cut into quarters removing cores, and flick seeds into a sieve set over a bowl. Chop tomatoes coarsely. 2 Put tomatoes in a liquidiser, (or food processor bowl), with onion, red pepper, cucumber, and garlic. Whizz to a purée. Gently press tomato seeds to extract all the juice, then add the juice to the liquidiser. Add salt, oil and sherry vinegar, then whizz again adding enough chilled water to thin the soup to drinkable consistency. 3 Transfer soup to a container and chill until required. Serve with garlic croûtons. Preheat oven to 180°C (350°F). 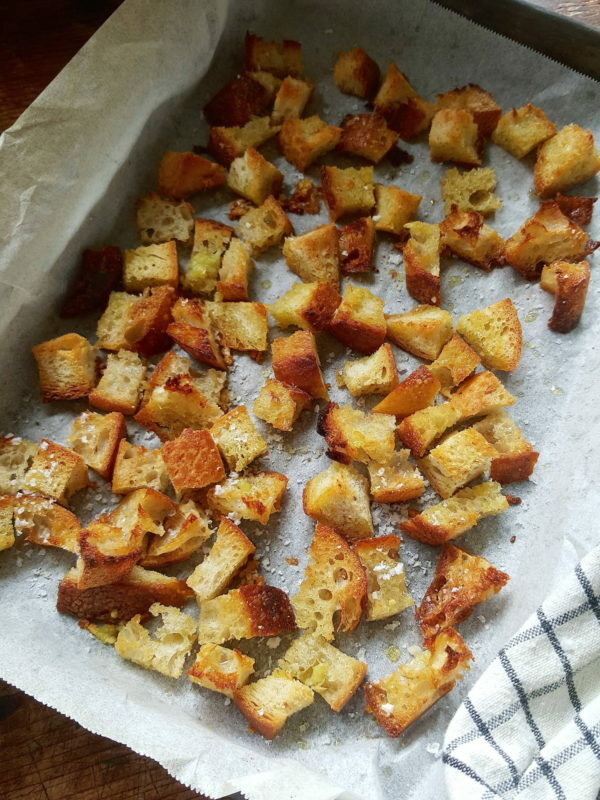 Tear bread into small pieces, or cut into cubes, and spread on a shallow tray lined with baking (parchment) paper. Mix garlic and oil and drizzle over bread. Lift the edges of the paper to help toss the bread crusts with garlic oil. Bake for about 10 minutes until golden. Sprinkle with sea salt. You cannot cheat with this soup. If you use insipid tomatoes, it will taste insipid. If you use old rank garlic, you’ll taste it. If you use a manky bitter tasting cucumber, the soup will have a bitter edge. Make it mid-summer, when everything is bursting with flavour, and the garlic is new season. Then, and only then, will it live up to its fine reputation: extraordinarily refreshing, invigorating, savoury and satisfying. 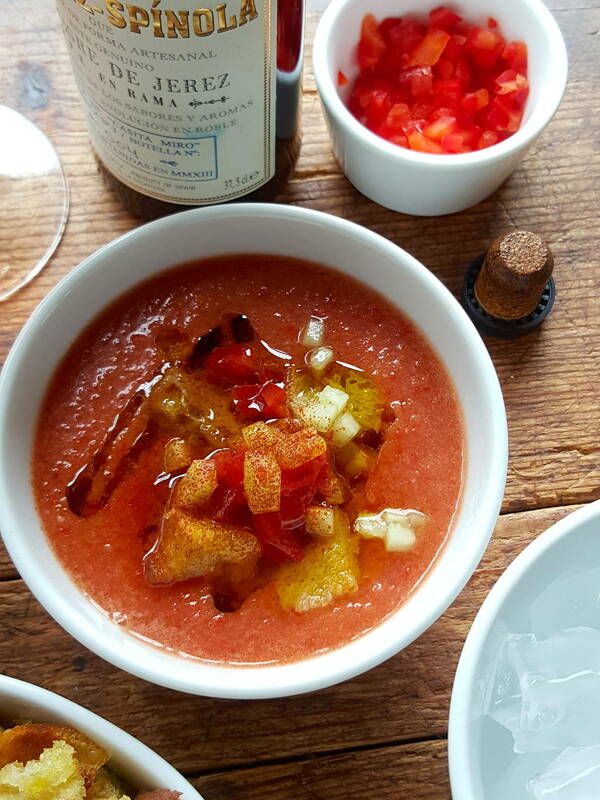 You can finely chop a little extra red pepper, tomatoes and cucumber if you would like to have some of these additions for the top of the gazpacho. And drizzle with extra virgin olive oil and add a dusting of smoked paprika. Check out the crisp and lacy edges! Fluffy mash, broad beans and succulent spring lamb. Eat it up! Bake a batch of these bad boys, grab some olives, good bread, tomatoes – that kind of thing – and have an easy summer feast!